How convenient, huh? Gray whales migrate from the chilly waters of Alaska to the warmth of lagoons off the Baja Peninsula during our winter holiday break, and then return north during spring break week in March — all for the eyes to see from several spots on the Oregon Coast. Whale watching is one of the best sightseeing experiences one could enjoy in Oregon. The best time to see the passing gray whales is Dec. 27-31, and there'll be approximately 20,000 of the majestic mammals in transit off the coast. "We get to see the bulk of them when they travel. Our official Whale Watching Week coincides with the whale migration, and sometimes lands on the peak," says Peter McBride, a seasonal park ranger with Oregon Parks and Recreation, which administers Whale Watching Week, based in Depoe Bay. "Sometimes it's the first couple weeks of the new year. We get a lot of folks (visiting) from all over the Northwest, and a huge amount from Portland. It gets actually a lot of attention from across the country. Oregon has a lot of amazing scenic viewpoints." 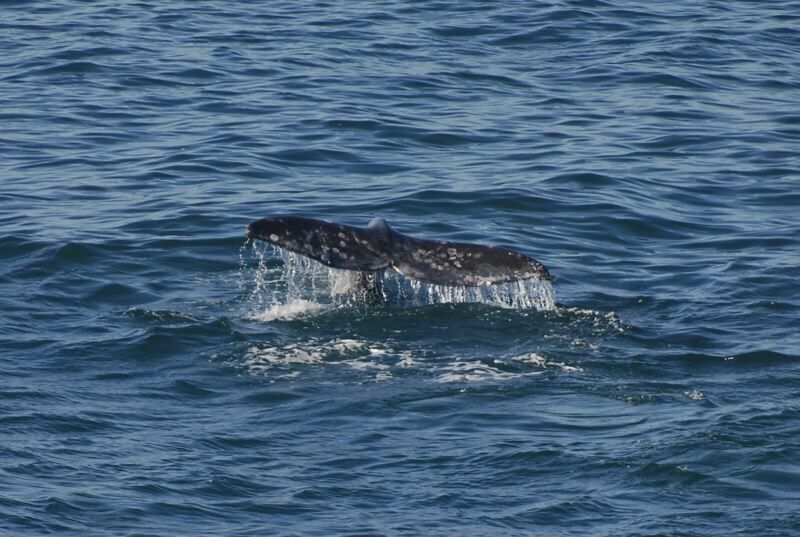 Gray whales are migrating for survival, and not for leisure time in warm weather. Calves are born and breeding grounds exist off the Baja Peninsula. It's a round trip of 12,000 miles for reproductive purposes. In Alaska, the whales spend summers and fall feeding in the Chukchi Sea (or Bering Sea), then head to Baja, where new mothers stay the longest period of time. The reduction of whaling boosted the gray whale population, but the number has decreased slightly in the past two decades, McBride says, as a result of less food. They eat small invertebrates, as well as shrimp and small amphipods, finding their food by burrowing their jaws into sea-bottom sand. The gray whales are known as the Pacific Coastal Feeding Group. They don't feed in too-deep water — about 70 meters in Depoe Bay. Some have been seen feeding in water as shallow as 20 feet. As for time spent underwater and rising to breach, McBride adds: "They don't do super long dives, typically 3-5 minutes, and then come back to the surface to replenish that oxygen." It's all wonderful, if you enjoy awe-inspiring nature — and most people do. "That's one of the neat things about being in the business," McBride says. "You see people enjoy it for the first time, and sometimes it's their hobby to whale watch. "I've been doing it quite a long time, most of my adult life. It's just amazing, being able to see them come in close, truly amazing how they can be right off the rocks. They're fun to watch." 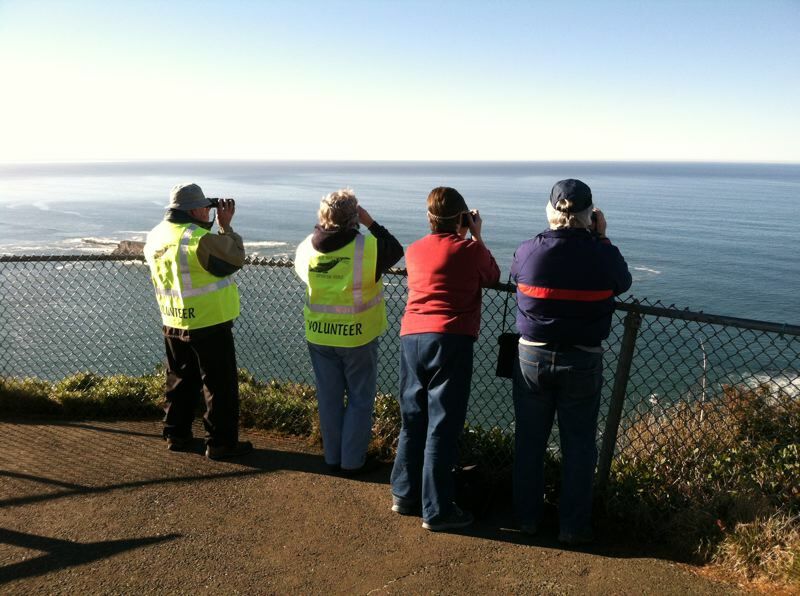 Thousands of people have done their own migration to the Oregon Coast to watch the gray whales over the years. Interestingly, it was only in 1978, when a group of people — Don Giles of the Oregon State University's Hatfield Marine Science Center in Newport, and colleagues Bruce Mate and Denise Herzing — confirmed that the gray whales instinctively passed by the Oregon Coast at such specific times of the year. It led Giles to start the Whale Watching Spoken Here program, which has become one of the most organized onshore whale watching programs in the United States. The program provides volunteers at 24 locations up and down the coast, from Ilwaco, Washington, and Cape Disappointment to Harris Beach in southern Oregon. They are stationed at the spots from 10 a.m. to 1 p.m. daily. There are some 250 volunteers helping to educate people during whale watching weeks. "We're always looking for new volunteers for future years as well," McBride says. Last year, 30,000 people visited whale watching spots, according to Oregon Parks and Recreation. There are many great places to view whales; McBride and Portland folks might be partial to Newport and Depoe Bay, which gets very busy in the last week of December and March. Oregon Parks and Recreation says that about 30 whales per hour migrate past the Oregon Coast during peak southbound migration, and six per hour as they head north during an extended, four-month time period. Some 200 whales drop off the migration route and feed along the Oregon Coast all summer. "Whales are a special part of the Oregon Coast," says Luke Parsons, an Oregon Parks and Recreation seasonal ranger. "I hope visitors walk away feeling a little more connected to these animals, along with a greater appreciation of our oceans." A map of the 24 volunteer whale watch sites can be found at http://www.whalespoken.wordpress.com. Camping is available at state parks; visit http://www.oregonstateparks.org for information.